Crocus sativus thrives in the Mediterranean maquis, an eco-type superficially resembling the North American chaparral, and similar climates where hot and dry summer breezes sweep semi-arid lands. It can nonetheless survive cold winters, tolerating frosts as low as −10 °C (14 °F) and short periods of snow cover. Irrigation is required if grown outside of moist environments such as Kashmir, where annual rainfall averages1,000–1,500 mm (39–59 in); saffron-growing regions in Greece (500 mm or 20 in annually) and Spain (400 mm or 16 in) are far drier than the main cultivating Iranian regions. What makes this possible is the timing of the local wet seasons; generous spring rains and drier summers are optimal. Rain immediately preceding flowering boosts saffron yields; rainy or cold weather during flowering promotes disease and reduces yields. Persistently damp and hot conditions harm the crops, and rabbits, rats, and birds cause damage by digging up corms. Nematodes, leaf rusts, and corm rot pose other threats. Yet Bacillus subtilis inoculation may provide some benefit to growers by speeding corm growth and increasing stigma biomass yield. The plants fare poorly in shady conditions; they grow best in full sunlight. Fields that slope towards the sunlight are optimal (i.e., south-sloping in the Northern Hemisphere). Planting is mostly done in June in the Northern Hemisphere, where corms are lodged 7–15 cm (2.8–5.9 in) deep; its roots, stems, and leaves can develop between October and February. Planting depth and corm spacing, in concert with climate, are critical factors in determining yields. 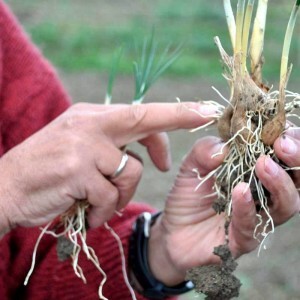 Mother corms planted deeper yield higher-quality saffron, though form fewer flower buds and daughter corms. Italian growers optimize thread yield by planting 15 cm (5.9 in) deep and in rows 2–3 cm (0.79–1.2 in) apart; depths of 8–10 cm (3.1–3.9 in) optimize flower and corm production. Greek, Moroccan, and Spanish growers employ distinct depths and spacing that suit their locales. C. Sativus prefers friable, loose, low-density, well-watered, and well-drained clay-calcareous soils with high organic content. Traditional raised beds promote good drainage. Soil organic content was historically boosted via application of some 20–30 tonnes of manure per hectare. Afterwards, and with no further manure application, corms were planted. After a period of dormancy through the summer, the corms send up their narrow leaves and begin to bud in early autumn. Only in mid-autumn do they flower. Harvests are by necessity a speedy affair: after blossoming at dawn, flowers quickly wilt as the day passes. All plants bloom within a window of one or two weeks. Roughly 150 flowers together yield but 1 g (0.035 oz) of dry saffron threads; to produce 12 g (0.42 oz) of dried saffron (or 72 g (2.5 oz) moist and freshly harvested), 1 kg (2.2 lb) of flowers are needed; 1 lb (0.45 kg) yields 0.2 oz (5.7 g) of dried saffron. 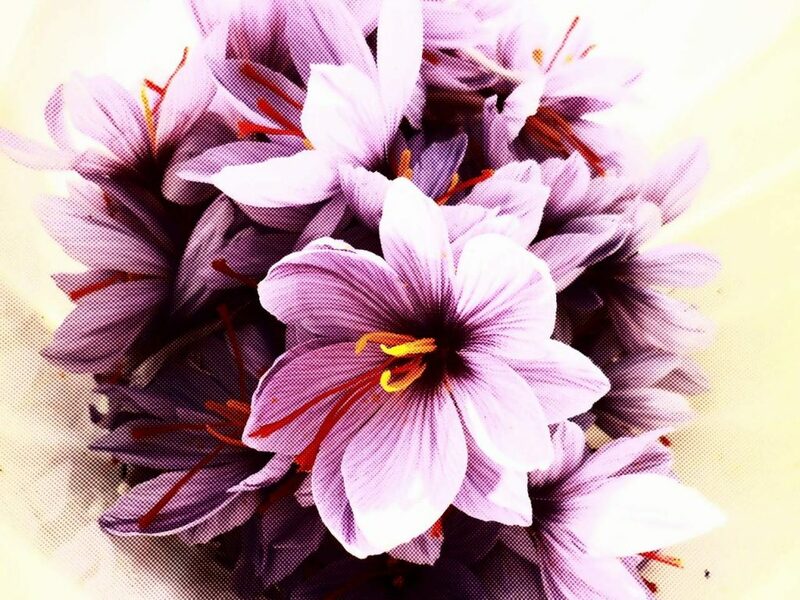 One freshly picked flower yields an average 30 mg (0.0011 oz) of fresh saffron or 7 mg (0.00025 oz) dried.